This freeware is a quick and easy way to detect differences in audio signals -- and thus the effect of components changes on your music system. Many audiophiles are interested in making changes to their audio equipment to improve performance. Modifications, or “mods,” can range from changes that border on redesign, such as replacing a tweeter with a different type, to less fundamental changes, such as rewiring the innards of a power amplifier with silver leads. Even less invasive changes to an audio system—in which no screws or covers get removed during installation—are usually called “tweaks.” These could be old stand bys such as contact treatments put on connectors, or newer, more radical changes involving special woods that are said to make the system sound better just by being in the room. Tweaking has become almost a separate hobby of its own these days, with recommendations of countless “free” tweaks easily found on the Inter net and an entire industry of not-so-free (and sometimes downright expensive) tweaks for more adventurous audiophiles. Tweaks usually seem to be controversial, often without generally accepted explanations—and sometimes no explanations at all—about how they could work. I am by profession an analog/RF electrical engineer at a large corporation and also develop audio test equipment and software with Liberty Instruments. You might assume, then, that I have an extreme “objectivist” point of view, discounting anything that is not predicted by known theory. But that’s not quite true. Like many, I trust engineering concepts. But I won’t declare an idea to be bogus just because it lacks undeniable proof. It’s always at least remotely possible that even seemingly off- the-wall ideas could work. Who knows, maybe there are non- obvious or yet-to-be-explained mechanisms operating? I’m even using some tweaks right now in my own system. I have a special mat placed under my power amp, and a painted statue sitting on its chassis, and I have not the least doubt that they greatly improve the listenability of my system. Wait, don’t go away shaking your head! Let me explain why they’re there. The amp is an older, rebuilt, modified Dynaco. I keep it sitting on the floor near a corner, driving my main speakers. I recently noticed a weak but bother some hum coming from the amplifier. The noise wasn’t induced into the speakers, but came from the amplifier chassis itself. Apparently, the laminated core of the power transformer was vibrating with the AC power waveform, and the vibration was getting into the chassis and from there to the floor, projecting a low humming sound into the room. I tried tightening the bolts that compressed the laminations, but it didn’t help. I also came up empty after a brief search for an inexpensive replacement transformer. So, I tried putting some folded foam padding under the amplifier to isolate it from the floor. That helped, but the chassis still was radiating hum directly through the air into the room. I noticed that if I pressed down a little on the chassis, the hum level would drop. And if I pressed down hard on the chassis, the hum was essentially gone. Conveniently nearby on the fire place hearth sat a heavy statue of Nipper (RCA's mascot) that was given to me by a friend. Well, soon Nipper was standing guard on top of the power amplifier--and the hum problem is now gone. It's not an audiophile delusion after all, it's just that those tweaks help in ways that aren’t immediately obvious. But the possibility of an unknown operational mechanism exists for any wild concept you might imagine, and there isn't infinite time or interest to check out very many of them. There are plenty of real, known issues to pursue in audio that have a tremendously higher likelihood-at least for technically educated people-of bearing fruit. Before I become interested in investing time or money and actually trying some tweak or seemingly unlikely mod, I like to see some reasonable, competent, nonsense-free theoretical explanation about how it might work; or, failing that, some evidence that it actually does. Testimonials really don't count for much and are very easy to come by for promoting or discounting just about anything. With some tweaks demonstrated to me by honest audiophiles, I know I couldn't hear any effect and wasn’t convinced that the demonstrator was really hearing any thing that the tweak was doing, either. Audiophiles, after all, are all about illusions—they build systems in the hope of convincingly presenting live musicians right there in the room, when any sane person can plainly see that there aren’t any! We regularly strive to be deceived by our systems and to give in to our imaginations. Actual evidence can be hard to come by, though. ABX testing, which aims to offer it, is time consuming to do, and it’s complicated to maintain controls that might guarantee a verifiable result. And ABX also seems like a tedious operation that would not be much fun, at least not compared to relaxing and just listening to music. And the results of ABX are too often challenged on the basis that the ABX switch- box itself might be masking differences that could really be there. That argument seems to me to be more than a little like a dodge, but it could be possible, I guess. And, should no evidence of an audible difference be uncovered in an ABX test, the strongest statement that might be made is that no audible differences were revealed while using that given set of associated equipment, by that particular set of listeners, with those particular recordings, at that particular time. At best, it might be suggested, but never be proven, that something is completely in audible. But the opposite could be proven were it to be the case—that something is audible under some circumstances. That would be a useful result and might lead to something interesting. I admit that I’m suspicious of companies and audiophiles who say that improvements made by using (as examples) particular interconnects or power cords are absolutely audibly obvious. Yet none of these persons have ever demonstrated at an AES convention, for example, the ability of even one listener to differentiate, by hearing alone, when different components are changed. It seems this would be an easy demo to set up for such obvious improvements, and could result in fame for that listener and a chance to shake up the foundations of audio engineering, while providing excellent press coverage and powerful material for advertisement copy for manufacturers. Cable companies might choose to consider doing this if they really believe in their products. With the lack of interest in conducting time-consuming verifiable ABX tests, or for making clear and incontestable public demonstrations of differences being heard, it would be good to have some other ways to get evidence that tweaks or mods might be worth checking out. Particular skepticism toward some of the tweaks or mods results when they lack any apparent way that they could even make any difference, much less one detectable by ear. If a tweak or mod changes nothing, then I at least would conclude that there’s no difference to hear. If some thing in an audio signal does change, then there’s at least a chance. So a good first step toward giving evidence for a tweak or mod might be to show that it does something to an electrical signal in equipment or to sound in the air. You need a way to show when audio signals have changed; that is, when one audio signal made one way (without tweak or mod) is different from one made another way (with tweak or mod). It would be better still if you could listen only to the part of the signal that was different, removing the unchanged part of the signal, so you could tell whether those changes all by themselves might register to your ears. Flash back to your school days when you recall that “difference” in math has a particular meaning: subtracting the subtrahend from the minuend resulted in the “difference.” When two numbers or expressions are different, then their difference won’t be zero, while a “zero difference” would mean that there wasn’t any difference between the expressions before subtraction; i.e., that both expressions were the same. When you talk about differences in audio signals, the concept is very similar. You can also subtract the signals rep resenting sound in a sound system. In analog electronics, subtraction is done by inverting the polarity of the second signal and then mixing (summing) the two together. If the signals were exactly the same, they would cancel each other out and leave a silent signal, a difference of zero ( Fig. 1). If they didn’t leave anything (except maybe the noise which intrudes into any analog process), then the signals weren’t different. If they leave something other than noise, then the signals must have been different in some way. 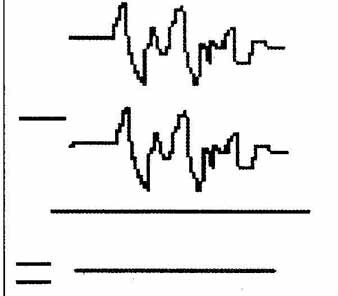 In the digital domain, an audio signal exists in a series of values of the voltages in the signal at successive time intervals (samples). If you had two digitally recorded signals, you could see whether they were different by essentially the same method, by subtracting the values of matched samples at each point through the series. If they were exactly the same, you’d get a series of zeros, a recording of silence. If the recording equipment had some distortion, you’d still get just silence because the same distortion acting on the same signals would give the same result. 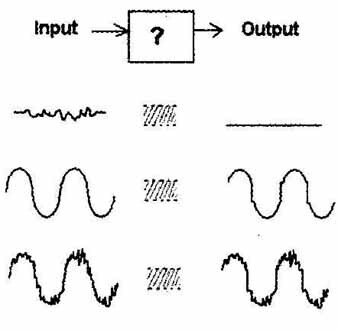 If they differed only by noise that was produced when the signals were produced (such as from an analog to digital converter), then you would get that noise in the “difference signal,” because noise is always changing. You can use this process to see whether two signals are different, testing whether use of a tweak or mod has changed any thing. If you obtain from that a result that seems significant, you will have some evidence. You won’t have proof, though. The test could have been done erroneously, for instance. If that possibility is dispelled, then it’s still possible that the change that was uncovered may not be large enough to be heard. You can probably make an estimate (subjective) of that by listening to the level of the “difference signal” in comparison to the level of the original signal. That way you could rather easily tell for your self whether any difference that may be there could be significant for you. Though again, you won’t ever prove that some one with perhaps better hearing abilities wouldn’t hear something he/she believes is significant there. Even though the signal subtraction process by itself won’t give you definite proof either way, discovery that there is some difference might be enough to warrant looking further into the tweak or mod. Lack of a significant difference would—to me at least—imply that the tweak or mod isn’t worth putting time into. There is a complication in using signal subtraction to indicate possible changes when a tweak, mod, or accessory has been applied. The two recordings that will be subtracted must usually be made at different times if the system is to have been changed only by the tweak, in a before and after comparison. Some way is needed to shift time in the recordings so that equivalent time instants will be properly compared. That’s where computer processing can help. “Audio DiffMaker” is a freeware soft ware program I have written to provide this ability. I made it to help obtain and share evidence about whether a given tweak or mod has actually made a difference to an audio signal passing through the electrical parts of an audio system on the way to the loudspeaker terminals. DiffMaker won’t likely be able to deal with what happens to the signal after the speaker has turned it into sound, because even minuscule movements of a micro phone or changes of reflecting objects (or even air movements) in the room are often enough to result in an audible difference track. Nor will DiffMaker be able to address tweaks or mods that might affect a listener directly rather than through the music signal. But DiffMaker should be able to help demonstrate differences made by cables, component parts changes, CD treatments, and many others, if they exist. DiffMaker is intended to be convenient and reason ably fast to use, and even people at different times or places can participate by listening to shared difference tracks on their own, evaluating for themselves with little effort. While it can’t provide proof of audibility, like ABX conceivably might, DiffMaker could give strong evidence that a tweak or mod may at least be doing something, and within a short time. Or it could make a pretty convincing demonstration, which you could provide to others for them to witness as well, that perhaps nothing has really changed. So, how does this test work? You need a computer and a high-quality soundcard with line-level inputs. The basic process is pretty easy to understand. First, get a copy of the Audio DiffMaker software, which you can download for free from www.libinst.com. It runs in Windows 2000, XP (most recommended), Vista, etc. Install the application, then find “Liberty Instruments” in your start menu so you know where to start DiffMaker. Try to use a stereo system in which you expect or it’s been reported that the tweak, mod, or cable makes a significant difference to the sound. Try to use the same program material or musical cut that seems to exhibit the difference well. CD treatment, you can make your record from the output of the CD player. If testing an interconnect cable, test perhaps at the output end of the changed cables or further downstream. Above: Fig. 1: Subtracting signals. If the point operates at a line level of a volt or two, you may be able to just use some y-adaptors to pick off the signal to supply it to your soundcard’s line inputs. If at higher level (like the output of a power amplifier), you should put some resistors (2Okfl or more) between the “hot” center conductor wires feeding the soundcard line inputs and the large signal voltage. Don’t connect your power amplifier’s big output signal directly to your soundcard’s low voltage input unless you enjoy replacing burned-out soundcards or computers! Next, start the DiffMaker software. 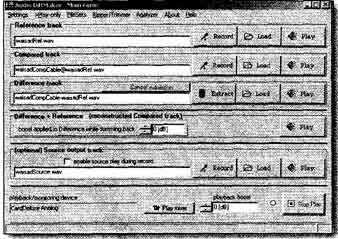 The first form that appears on the screen, “Settings” ( Fig. 2), lets you select the recording and playback soundcard(s) you want to use, should the computer have more than one. You can also select an optional “Source” soundcard, to be de scribed later. When using DiffMaker, you will play the same section of music at least twice, with and without the tweak or mod. You can source the music signal either by playing a CD, SACD, and so on, from your deck or from having the DiffMaker program play a musical track through the line-output of your “Source” soundcard ( Fig. 3). DiffMaker has several utility programs built-in, and, if desired, you can use one of them, the “Ripper/Trimmer” ( Fig. 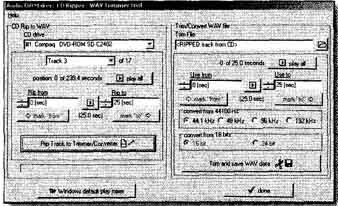 4), to rip part of an audio track off a CD into a WAV file for use as source test music. • The “Reference Track”: one of the tracks (recordings) that you will be comparing, usually the “before” track. There is also the optional “Source” track, which you can use to play out to the stereo system, as I mentioned. To make the first recording (probably the one before a tweak has been applied), click on the “Record” button in the box marked “Reference Track.” This will make a “Recorder” form appear ( Fig. 6). Using this Recorder is easy, and the help menu at the top of the form will show you de tailed instructions. The Reference Track (and other tracks) that you record should be relatively short, under 30 seconds usually. That’s so the computer won’t take too long in processing them later and also to minimize effects of any “gain drift” or “time drift” (which are described in the help file). You need to record a Compared Track that is recorded when substantially the same section of music is playing. The starting positions of the two tracks, with respect to the test music, should be within about one second and should end within the same second or two. Above: Fig. 2: The settings form. Above: Fig. 3: Setup for making recordings. Then you will subtract the recorded signals, one from the other. Do this by clicking the “Extract” button and waiting for the process to complete. You may expect that subtraction should be a fast process, but there are some complications that actually make it rather time consuming. The Reference and Compared tracks need to be in the same relative time position together, in lockstep, in order for subtraction to be able to possibly leave a nearly silent result. The signals from equivalent time instants should be subtracted, because any small time shifts or mismatches will degrade results (i.e., show a difference that might not be there). Taking two very similar recordings and aligning them to within one sound sample (tens of microseconds) isn’t difficult, using an FFT-based process called “correlation.” But being within one sample isn’t nearly close enough. 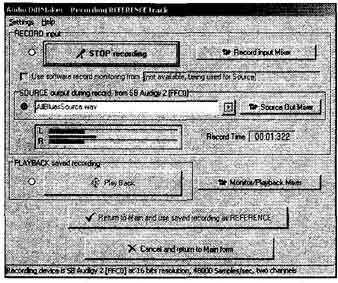 Time adjustment between recordings needs to be matched much closer than to within one sample to cancel signals to below audibility. DiffMaker uses a frequency domain process to bring time adjustments be tween mostly identical, but shifted, signals even to within nanoseconds. The adjustment is done on the Compared Track, which then is shifted to best match the time position of the Reference Track. Because very small and simple amplitude (“volume,” “gain,” or “level”) differences are usually of no interest when looking for tweak differences, DiffMaker also optimizes the amplitude match between the two recordings. It does this by making the Compared Track louder or weaker as needed, until it finds the best match to the Reference Track. When the adjustment and subtraction are done, the Compared Track will be replaced by its time-shifted version, and the Difference Track will be presented. An important ability of DM is to play several tracks in matching time, allowing the operator to shift between hearing one of the original signals and the difference sound that results from subtracting. This allows a fair comparison of the level of any revealed difference (or of noise) to the level of the original music track. When you are playing any of the tracks, you can instantly switch to listening to a different track (Reference, Compared, or Difference) by clicking its play button. The multiple playback ability is also important because it allows results of a comparison to be experienced by others. You can use DiffMaker to allow others to listen to results of tests you make. To simplify the program operation for them, change the Main Form into a simple-to-operate “Play Only” form ( Fig. 7) using the menu option of that name. Above: Fig. 4: Ripper/trimmer form. After you have made a set of recordings and a difference track, you can use DiffMaker to bundle them, along with written comments, into a compacted (but lossless) “dyf” file that you can e-mail or post for others who have DM installed on their machines. Select “File Sets” in the menu to do this. When you are testing some component parts, there will be small, but easily explained, differences made to frequency responses. For instance, if the system drives a cable being tested from a relatively high impedance, differences in cable capacitance will slightly change the high-frequency response and phase shift. Even very small and inaudible response differences can greatly degrade signal subtraction results. DM is exceedingly sensitive to outrageously tiny changes, which is generally good, but sometimes frustrating to deal with. Any error in setup, or equipment drift, will result in an erroneous difference being detected. Everything must go correctly to approach a full cancellation. Above: Fig. 6: The recorder form. Above: Fig. 7: Play-only presentation of main form. If there are any already known differences, there will be a very noticeable signal level in the difference track. If you want to find out whether there are any differences other than in frequency response, you will need to first compensate for or avoid these differences in the responses. In some cases, such as with rolloff from cable capacitance, that may be relatively easy to do: add a fixed capacitor to the cable that has lower capacitance, or add resistive loading on the one with higher capacitance. First you need to be able to identify a response difference when you are adjusting it. So the Diff application includes an “analyzer” form ( Fig. 8), a measurement tool capable of resolving very small frequency response differences. The analyzer outputs a special noise-like sequence that sounds like pink noise, but isn’t quite. The advantage of using this sequence rather than real pink noise is that it’s keyed to the analyzer’s operation so that no settling time is needed—response differences can be found quickly and compensated in near real time. The operation of the analyzer is de scribed in the help file in the “analyzer” section, and an example of its use is given in a detailed Usage Example, also in the program’s help file. Above: Fig. 8: The analyzer form. When you compare the before and after sound of a system by ear to evaluate a tweak or mod, you face a tricky task. One problem is the time lag that it usually takes to get from one state to the other. The sound character must be remembered during that lag and the conditions of the system, the room, or even the listener can change in that short period. An even bigger complication is audible masking. The presence of some louder or more prominent sounds can make it difficult for an ear to detect effects of related but subtle sound character that effectively becomes covered up. There is also the issue of what is sometimes called “resolving power” In a high-end system, an audiophile listens for what evokes feelings of real music. In a clean, good-performing system, changes to subtle details or imaging qualities might be noticed. But if everything were to be routed, instead, through a clock radio, those small nuances wouldn’t register afterwards—not because the signal nuances aren’t there anymore, but because they just don’t matter to the ear anymore if everything already sounds so artificial and distracting. Subtle effects may be undetectable in a system lacking sufficient resolving power, and one grungy component somewhere in the chain might make a system unsuitable for critical listening. Recall that this is one objection that has been made about ABX testing: that the switchbox might lack enough resolution to allow differences to be heard. Masking and lack of audible resolution are problems during listening comparisons because people are listening for differences between separate situations. But a subtractive test such as the one with DiffMaker doesn’t detect audible differences, it looks for something more fundamental and simple. It isolates absolute differences into one track. Any thing different—not just what you might recognize while listening—is brought to light. Masking isn’t relevant or even meaningful, because it just doesn’t apply to subtraction. A “masked” difference is still different, when signals are subtracted. Nor does resolution of each component in the chain matter in non-absurd cases, because subtraction isn’t sensitive to or bothered by how much a presentation resembles music. When a difference track leaves nothing, you can be sure that the tracks being subtracted were the same, not that distortions or louder sounds somehow fooled basic arithmetic. In the first evaluation, the difference track is not analyzed for sound quality, but for whether it has anything in it. Unless a component could somehow strip off all traces of some “change” from an other signal—to make an output that is the same as it would had the “change” part never been there at all—the component’s output will still have effects 1 of that change. It could happen that some component along the way adds enough noise to obscure details that might otherwise be heard. In a differencing test, though, noise won’t subtract out, because noise at different times is not the same as at other times. In fact, it will even appear at a slightly higher level in a difference track, and a listener can readily hear whether there is too much noise to trust the result. But added noise can’t cause an erroneously silent difference track. Insufficient bandwidth in a component, such as in a soundcard’s recorder, might hide the presence or absence of a signal that changed previously in the chain, if that signal were completely be yond the soundcard’s frequency range. If you suspect this odd situation, operate DiffMaker with sample rates up to 192kHz (and at 24 bits), as high as commercial audio recordings are made. Extremely high-quality soundcards (better than were being used for commercial recording not long ago) have recently be come available at very affordable prices. Even if a component or soundcard were to have a dead zone near zero volts, able to block small signals, so that only voltages above a certain level would get to the output, that still wouldn’t make the component blind to changes in small musical details ( Fig. 9). Those small signals would still have an effect, when they are present with (and therefore superimposed on) normal level voltage swings that were large enough to appear at the output. They’d sound terrible, but would still exist, unless, of course, no signals at all were to get through. But it doesn’t seem unreasonable to require that you not use dead soundcards to use DiffMaker. The result of a DM test isn’t a number or graph (though one could be derived from it), but is instead a “WAV” file or audio track. It doesn’t so much say, “Yes,” “No,”, good, or bad, but rather, “Here’s how loud the difference is and what it sounds like.” That, I hope, may minimize arguments about the significance of results. It also somewhat addresses the common assertion that evaluations of audio product effectiveness should be done using ears rather than test equipment. 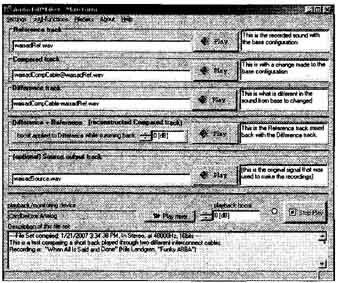 Evaluations in DM are made by ear, though with computer assistance. Any interested persons can personally make their own by-ear evaluation of whether the tweak or mod might be effective if they are sent the “.dyf” file and have loaded the free program. I hope to see evidence for something new in audio research and understanding and that DiffMaker may perhaps help break such new ground. Or, if not those benefits, that it will at least provide you some fun. Above: Fig. 9: A device with a dead zone: small signal details ride on the large signals. Top: a small signal atone. Middle: a large signal. Bottom: mixed large and small signals. 1. Baxandall, Peter J., “Audible Amplifier Distortion is Not a Mystery” Wireless World, November 1977. 2. 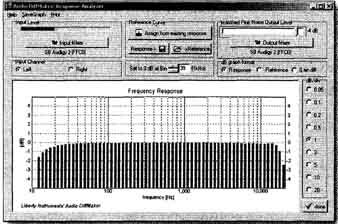 Hafler, David, “A Listening Test for Amplifier Distortion, ”HiFi News &RR, November 1986. 3. 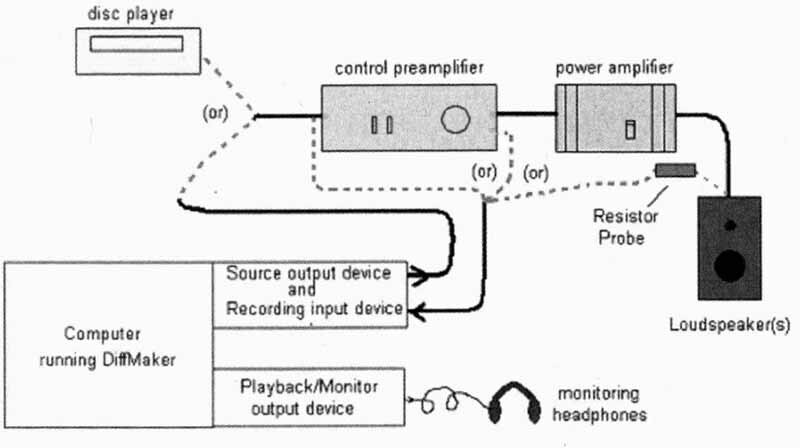 Dunn, Chris and Hawksford, Malcolm, “To wards a Definitive Analysis of Audio System Errors,” presented at the 9l AES Convention, October 1991, Preprint #3137.